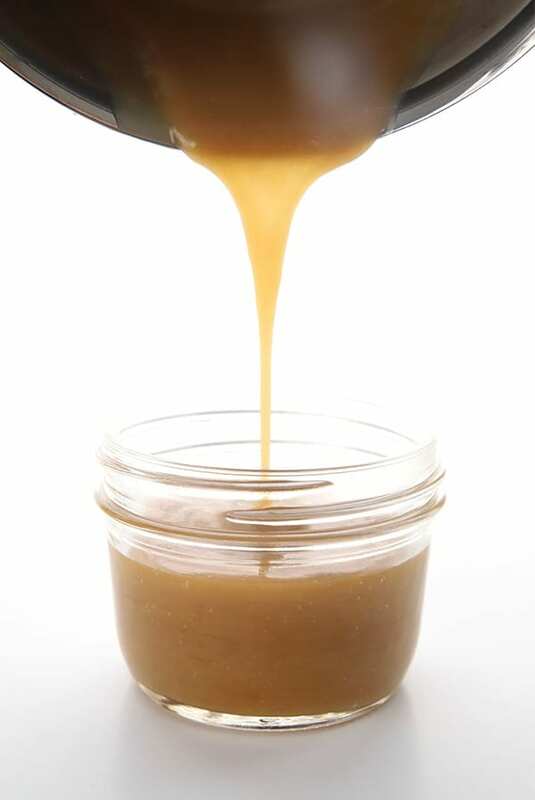 This sugar free caramel sauce is ooey and gooey and it stays pourable! Best of all, it tastes just like real caramel sauce. 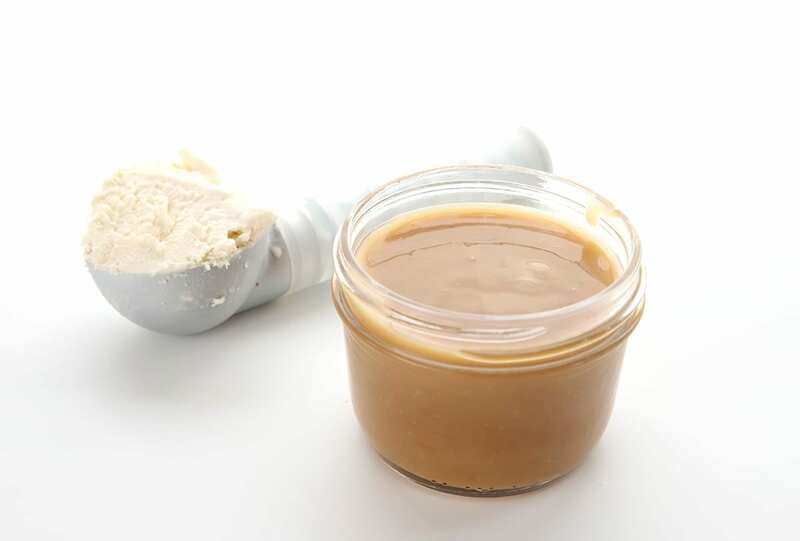 This is the only low carb caramel sauce recipe you will ever need. I am excited to bring you this updated recipe and a new instructional video. Creating a really good, true-to-life caramel sauce with erythritol has been one of my low carb goals for a long time now. 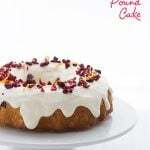 Almost from the first moment I started baking and cooking low carb, I found myself wondering if it was possible and absolutely determined to find out. Anyone who has ever worked with erythritol-based sweeteners will know that the last issue was the biggest challenge to overcome. I’ve made some great-tasting and great-looking sauces along the way, but they all had a tendency to harden up pretty quickly. Even my previous recipe, which I considered almost perfect, did begin to solidify and get a bit grainy as it cooled. The addition of some Yacon syrup, molasses, or even coconut sugar definitely helped offset that reaction, but it also added a little to the carb count. Some people objected to these additions but I felt that they were worth it to get really good low carb caramel sauce. But honestly, both Swerve Brown and Bocha Sweet have totally changed the sugar free caramel sauce game. Completely and utterly. How so? I first tried a bit of Bocha Sweet in my caramel sauce a few months ago and was astonished to pull it out of the fridge the next day and still have it be perfectly pourable. And when the long-awaited Swerve Brown finally came out, I tried the two together and I knew I had perfected this recipe. But please don’t worry if you can’t get your hands on these sweeteners. I am putting notes in the new updated recipe so that you can still make it the old way, with Swerve and a little Yacon syrup. It’s still amazing and delicious! 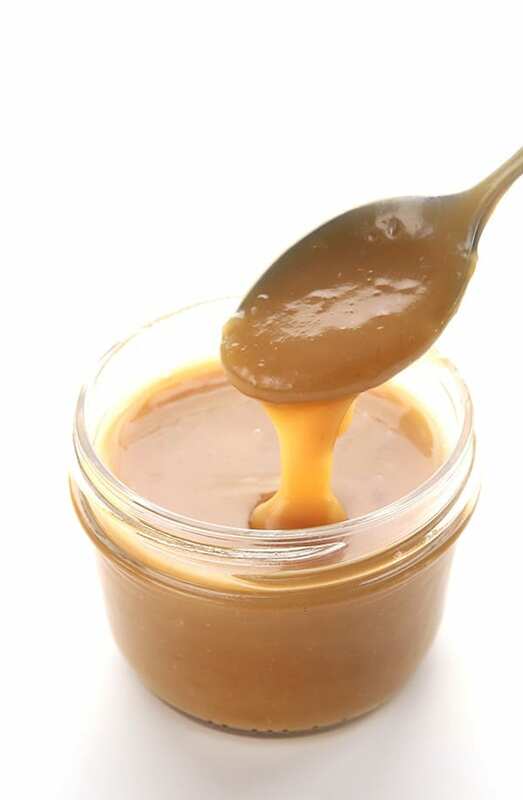 So put away all those awful store-bought, chemical-laden sugar free caramel sauces because this low carb caramel sauce recipe will blow your caramel-loving mind. Watch how easy it is to make! I’ve actually been using this caramel sauce recipe in many of my other dessert recipes for a while now, like my maple pecan pie. But I use it so often and found myself rewriting it so frequently, I decided that it needed to be a stand alone recipe. Believe me, it deserves it! It’s already part of some of my favorite keto dessert recipes and it will be part of many more to come. But it truly is good enough to be have its very own recipe post. Sometimes I just make some for the heck of it, just to keep in the fridge. 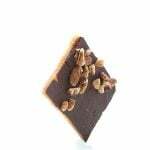 It’s fantastic slathered on a piece of very dark chocolate with a little sea salt sprinkled on top. Or drizzled over low carb vanilla ice cream. Or simply licked from the spoon. I really don’t think there is a better low carb caramel sauce out there. Back when I first wrote this post, I said if there was any way to improve on this recipe, I would find it. And I truly believe I just did. I can die happy now! 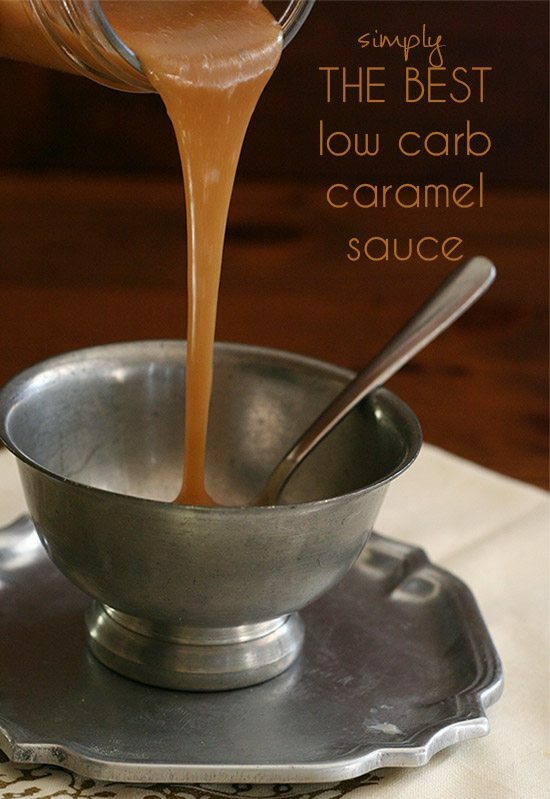 This is the only low carb, sugar-free caramel sauce recipe you will ever need. It's ooey, it's gooey and it stays pourable! Best of all, it tastes just like the real thing. The sauce can be stored in the fridge for a week or so (I've actually stored mine for several weeks). Just gently reheat in the microwave or in a saucepan to make it pourable again. If you can't get your hands on Bocha Sweet, use 6 tbsp Swerve Granular and two teaspoons Yacon syrup or blackstrap molasses. Coconut sugar or molasses! Neither are healthier than regular granulated sugar – although they sound “natural”. Fructose is more dangerous than glucose. Carolyn please keep working on this recipe – how about Yacon syrup? Tastes great and would make a good substitute I think. FWIW, black strap molasses is much lower in sugar than other forms of molasses. In fact, it really doesn’t taste sweet at all, and to my taste, much more like black licorice. I don’t have diabetes, and while I have given up sugar virtually entirely, I do occasionally use a bit of blackstrap in things like barbecue sauce – mostly for the subtle burnt-sugarish undertones. It is extremely high in many essential minerals. It’s sort of a villain with some virtues. Linda, I know exactly the choices I have here and how “healthy” they are or are not. I have chosen these things because they WORK in this recipe. The small amount of sugars in this keep the caramel soft but don’t raise the carb count much at all. I feel strongly that this small amount per serving is not an issue. Yacon syrup also contains fructose so if you need to steer clear of that entirely, I am afraid it’s not a great sub after all. Do you think I could replace the coconut sugar for honey? I seen someone’s post on Facebook making turtles, so I needed a keto friendly caramel recipe, and you never disappoint. Anyways, I did them using some chocolate turtle molds I picked up at a garage sale a few weeks back, and also using your chocolate chip recipe (with just 1 more Tbsp of erythritol, it makes a pretty decent dark yet sweet chocolate bar). Anyways, I tried to cut down on the “sugar” in this recipe a little bit by only using 1 tsp of black-strap molasses. I compensated for the other 2 tsp (flavor wise) by using 2 Tbsp of “Just like sugar Brown” in lew of 2 Tbsp of erythritol (only used 1/4 cup of that), and then also using 1/4 tsp of toffee flavored liquid stevia to bring the hammer down on that molasses flavor. I also browned my butter a bit first, so when I added the tsp of molasses, it really got dark. It stayed pretty much like caramel even just above to room temp, but I guess I’ll see what it acts like tomorrow in chilled turtles. I put about a tsp+ of caramel with each turtle, and they seemed to have turned out pretty good, at least the deformed one that I devoured seemed exquisitely caramely (is that a word?). I ran out of turtle molds, so I got out my mini snickers candy bar molds (same garage sale), and proceeded to do some more pecan caramel chocolate bars, and even tried a batch with peanuts instead. Of course, then I ran out of chocolate half way thru, so I had to break into my emergency reserves of pre-made chocolate chips I had sitting in the freezer. I guess I’ll need some sort of a “nougat” to get a true Snickers bar (please let me know if you come up with that ;-). Again, thanks for all your efforts. Regular sugar has been depleted of its life forces, vitamins and minerals. It is processed. They make molasses out of all the minerals and vitamins from the regular sugar process. This is so rude! Telling her to “keep working on it.” Do you know how much time and effort go into recipe development?! If you have nothing positive to say, perhaps just leave your comments to yourself! Personally, I can’t wait to try this! Thank you for all you do to create these recipes! I made this sauce….it is divine!!!! 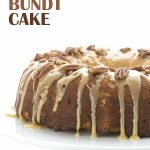 My husband loves caramel cake, for his birthday I made the cake and this “sauce” to pour over it, instead of doubling the sauce recipe, I simply made the cake into a Bundt and slathered it over the cake after cooling completely….was awesome. I agree with you, Jen! It’s one thing to respectfully disagree or ask for a sub (although that’s kind of bold, too). I’ve tried this both ways, and I much prefer the taste of the one with molasses to the one with coconut sugar. And I must confess, all I had in the cabinet was regular molasses. Guess I should buy some black strap. Just another note: I made microwaved lemon curd using erythritol instead of sugar, and it turned very grainy in the fridge. Next time I’ll add a touch of the real stuff and see if that keeps it from doing this. Erica – I’ve had good luck using powdered erythritol in my curds. 🙂 Good luck! I feel exactly the same way. Every recipe I have tried is wonderful. If I see Carols name on it, I know it will be good. Thank you for all your hard work Carol! My thoughts exactly. Like excuse me? Why don’t YOU work on it if you need a new recipe. People. Me three! I’m constantly amazed at how brave trolls are when there is a computer screen to protect them from those they choose to crack on! Carolyn, you’ve made sugar-free, low carb simply amazing, thank you for your hard work and sharing with us! I Agree. I’m making this sauce tonight and it’s hard to stick to a diet without people to work hard and come up with the recipes. How big is a serving? Looks “ono”. That’s delicious in Hawaiian. Thanks! Sorry, I must have missed it. Just so excited for caramel in my life again. O M G! You rock! You rock more than a rocking horse in a room full of small children! So, that being said… what do you usually use when making this… coconut sugar or blackstrap molasses? And thanks for all your work! I usually use coconut sugar. The molasses has a stronger flavour so I like the coconut sugar a little better. I wouldn’t worry about that small amount of coconut sugar. It wont make that big an impact unless you sit and eat the whole recipe, and trust me, this is SO GOOD it is tempting to do just that! I have made this both with and without and you really need the coconut sugar to give it a ‘real’ feel. I have not tried it with molasses. Carolyn this recipe inspired me to work on making some of my favorite candy low carb and sugar free and its has worked beautifully! So glad, Maria! And yes, I don’t recommend sitting and eating the whole batch. The 2 tbsp serving is quite generous and honestly, you don’t even need that much. It goes quite far in my other recipes where I use it…those are usually 12 to 16 recipes so it’s less than even in this recipe. I am going to cover some cashew nuts with this and bake – will let you know how it goes. And can’t wait to try this over my homemade vanilla ice cream yummmmmy. Thanks you Carolyn for doing the work so we can have healthy alternatives. OK. I didn’t even make it past the BSM*+sugar+butter stage…I tasted it and thought OMG this is fabulous. I just poured that over my cashews and then stuck them in a 350 oven for 5 or so min, took them out and have been spooning them over and over on the parchment covered cookie sheet for about 10 min now. They are sooo hot I keep burning my fingers trying to taste them. Gonna sprinkle sea salt over them when they get cooler. I think I should have used almonds or pecans…or some other nut. NOW. This carmel sauce with all of your ingredients is going to be made tomorrow for my homemade ice cream. *The Black Strap Molasses gave it a really nice taste. I did boil the BSM+sugar+butter for the 3-5min. Oooh…..this looks delicious! And I’m REALLY excited about the prospect of the maple pecan pie you mentioned – I’ve been thinking about how to stay low carb through Thanksgiving and pecan pie is the one dish I would really miss! Thanks! I wonder if you could use xylitol and get a good result – I use that sometimes and it seems to work really well in baking. Xylitol won’t caramelize as easily, which might not be an issue if you use the blackstrap molasses. I usually make my caramel with Xylitol – it doesn’t caramelise – you heat it up and boil it for a bit, then take it off the heat and add the butter and cream – they then go a sort of dark brown colour. The only problem with it is that it crystalizes horribly when it cools. I buy bulk Erythritol by Now foods from iHerb – its just pure Erythritol – maybe that might work better for you than Swerve ? Hi Molly…no, plain erythritol won’t be better than Swerve, as I have tried it in the past. Swerve caramelizes better but both have a tendency to re-crystallize. It’s the coconut sugar/molasses and the xanthan gum that keep it from re-crystallizing so much. 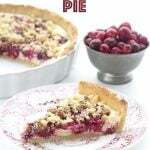 But you can use the Now erythritol in this recipe, it just might harden a bit more. Not sure. You can probably use other erythritol, you just may not get quite the same results. Why do you hate Swerve? You and your recipes are truly amazing! I made this recipe and it is to die for! I made a caramel custard recipe from another wonderful low carb cooking guru and then topped it off with this. I was in heaven!! Your “cranberry jalapeno cornbread” recipe was so intriguing that I also made it today. It was delicious topped with a little butter and with my dinner tonight! Thanks, Joyce! Love hearing that it helps people. Love this! Such a creative recipe! Just to add – THANKS for this – I have a recipe for caramel but it crystallizes 🙁 Am off to get some coconut sugar ! No, this recipe really depends on it. You can try plain erythritol but I don’t think it will work as well. I made this recipe yesterday with Now Foods erythritol (ground into powder) and about 1/4 tsp liquid stevia and I think it turned out as it is supposed to. I also had to use half and half instead of heavy cream ’cause that’s all I had. It thickened up very nicely and it is only slighly grainy when cold. I probably wouldn’t even notice the slight grainy texture at all if I used the caramel in a recipe. Next time I will only use 1 Tbsp of molasses though, as mine seems to be quite strong in flavor. Thanks for the feedback. I find the molasses to be a little strong too, but when I cut back on it, it does tend to get grainier. If you want it less strong, try coconut sugar – I have a bag and it lasts me forever because the caramel sauce is the only thing I use it in. Sorry Carolyn, I forgot to say thanks for the awesome recipe. I am so looking forward to your Maple Pecan Pie recipe. To late for our Thanksgiving but I’ll be making it at Christmas time for sure. Thank you! 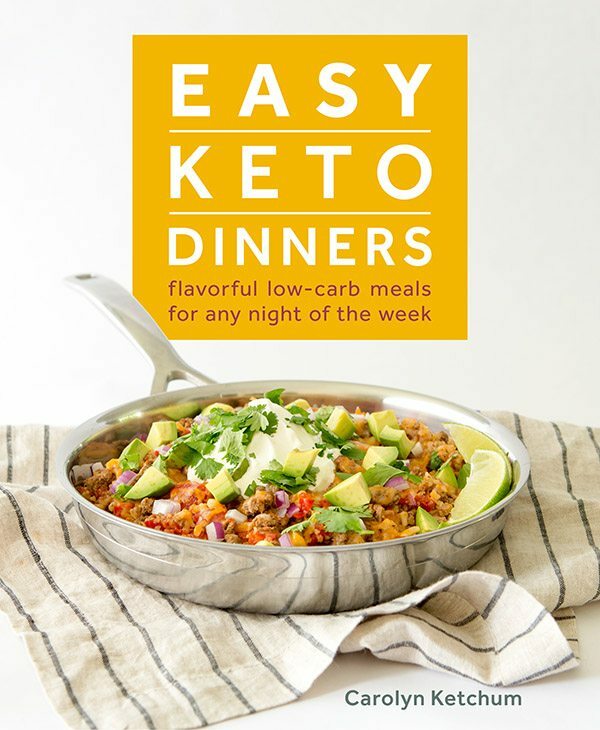 I’ve been looking for a lower carb version and it looks so good! I can’t wait to try it. Thanks so much for sharing your creations! Yes, I think it would work pretty well. One reader says she does this all the time! Hi Carolyn! Thanks so much for the caramel recipe, just in time for the holidays. I have a question, could I use this to drizzle over cakes or cupcakes to replace using frosting? Thanks! You bet! 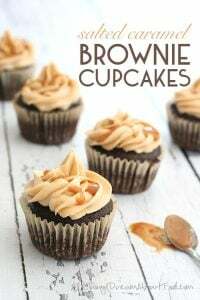 It’s great on cakes and I’ve used it in frosting on my Salted Caramel Brownie Cupcakes. Thanks for the amazing recipe! It looks and sounds fabulous and I am going to make some. How is the moving going? Have you moved yet or still packing? We move officially on Nov 24th. Moving/pacing is still in progress! Oh my. I feel for ya! Going to be a busy prelude to Christmas! I recently started using a sweetening product called “Just Like Sugar”. It is made of chicory root fiber. Would this work in your caramel sauce recipe? Thanks. I really don’t know without trying it myself. But I suspect not, since this recipe relies on erythritol. It’s worth a try, though! How can you make this vegan? Will a nondairy milk work? One reader has said that full fat coconut milk works. I haven’t tried it myself! I’ve had success with full fat coconut milk in other caramel recipes. I used cream for this one. Is there a difference in molasses? I have a bottle of unsulphured molasses but it doesn’t say blackstrap. That’s fine. It has a slightly higher carb content (only 4 more g per tbsp, so it goes about .5 g per serving) and lower mineral content so it’s not quite as healthy. Oh goodness, I can’t wait to make this! I’ve been using the Walden Farms caramel sauce because it was (until now) my only option– and it’s not even very nice-tasting, let alone all the chemicals in it!!! I’m just curious Carolyn, have you ever tried tagatose? I’m told it caramelizes exactly like table sugar so it’s good for caramels and things that require browning. It’s so expensive and hard to find though! Best of luck and speed with your move, and thank you so much for taking time out of this busy and stressful period to keep us supplied with new recipes. You’re the best! I haven’t tried it but I have heard of it. I am leery of things ending in “ose” as that denotes a sugar and I am suspicious of claims about low glycemic index. They said the same thing about agave and it spiked me as much as table sugar. I’d have to try it on my own blood sugar before I’d use it in recipes for readers. LOVE THIS! I used Xylitol and Molasses as it’s all I had and it it turned out perfectly…could seriously not tell the difference in a normal caramel taste! I do grind my xylitol to a fine powder first before anything I cook with it, so maybe thats why it worked so well with the xylitol? Either way, thanks for the recipe! Even though the xylitol I used brought the carb count up, it is still a HUGE winner and healthier than a regular caramel. Cheers from Aus! If I double the recipe and then eat it ALL- is that considered a serving?!!!! Bwahahaha!!! AwEmAzInG!!!! What is considered a serving??? I think it’s 2 tablespoons. this is the best danged caramel sauce!!! You rocked it Carolyn!! Thanks, Dinah. Based on your feedback, I may change the recipe for 1 tbsp blackstrap molasses instead of 2. I think it’s just too much . Hi, Carolyn. I made this sauce for your pecan pie recipe and although I burned it slightly, it still had a wonderful caramel taste. Do you have any tips to keep it from burning? I watched it very closely and stirred it often. I cooked it for 4 minutes. Do I need to stir it constantly and cut down on the time? Or is constant stirring the key? By the way, loved the pecan pie!!! I wasn’t a huge fan while it was still warm but after leaving it in the fridge overnight it was AMAZING! Thanks for all your low carb desserts that don’t leave us missing our high carb alternatives. It could be your pot or the heat of your stove. Is it electric? If so, turn it down a bit and do stir pretty constantly. I found that the brand of butter mattered in the burning risk. Great Value did fine. Kerrygold burned when I blinked at it. Can I use Sukrin Gold instead of the Swerve? Seems to have the same ingredients. I also appreciate all your recipes! Have had success with several of them. Just a quick question – if I wanted to make caramel candies with this, what would I need to alter? I’m looking to make something close to the wrapped caramels we used to buy by the bag. Thanks so much for all you do! I am not certain you can make this into caramel candies…at least not the really chewy kind that stick to your teeth. Because it’s not sugar, and it just won’t quite work that way. But you could try boiling it down further until it’s a little more gummy. Then it will begin to harden more as it cools and you might have something you can work with. Marvelous recipe, as always! Can I sub this caramel sauce in your chocolate pecan bars? It sure the heck did! Just amazing! I made it with the coconut sugar, which I had on hand from my early keto days but haven’t used since. Now I will! I do seem to have quicker cooking times, maybe because I’m at altitude, mine was about 2 minutes. Lots of subs but it looks devine, it’s for tonight’s dessert. Thanks for another great recipe Carolyn! Every recipe I make of yours comes out perfectly! Just made this and I am in love….. thanks for such a yummy recipe. I have to stop my self from gulping it down. 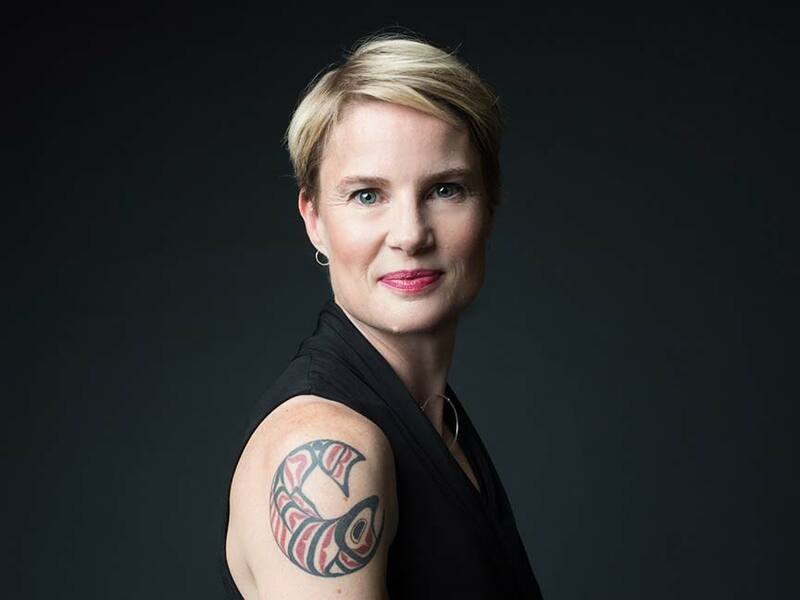 Carolyn-awesome sauce! Burnt my first batch badly. Electric stove……so second batch I used LOW heat and LeCreuset pot; start to finish 11.5 minutes. Total success. Went from almost crying to a happy dance. Making your pecan pie as a trial run today for Thanksgiving. Looking great now! Thanks for great recipes- good luck during your transition to the west coast. Yikes! I am so worried because our rental house will only have electric and I am so used to gas! Thanks for the lovely feedback! THANK YOU. I’m an espresso junkie looking for syrups that don’t use Splenda. Two tablespoons of this in my breve make me not miss my much mourned white chocolate powder. I used Swerve and molasses and skipped the Xanthum gum since I don’t have any. It works beautifully in coffee. I’ll be making this in bulk! Kapu- I used regular molasses and think it turned out well. This is the first low carb caramel I have made looks and taste like caramel. I hope your move is going well! I commented on your magic cookie bar recipe, but this caramel is so good I had to thank you here too. I didn’t think low-carb caramel was possible, but I am sooooo happy it is. Thank you Carolyn! In case anyone is looking for substitutions, I used xylitol instead of Swerve and it turned out great (for my other sweetener I used coconut sugar). I put my bars in the fridge last night and the caramel hasn’t crystallised at all. I must have done something wrong. I followed the directions exactly except I cooked it in the microwave instead of the stove. I was scared to “overcook/burn it” like the recipe warned so I just cooked about 2 minutes total. I guess just enough to melt the butter then i put the cream in. the end result is not thick or brown. It’s really runny and yellowish?? Yes, well…caramel sauce like this requires the heat of a stove to caramelize. So what went wrong is that you cooked it in a microwave. Not really sure what else to say. Hi there, thank you for the response. Even though the caramel sauce did not turn out for me I made the salted caramel cream cheese frosting for cupcakes. OMG, they were SO good. so, thank you for that. I tried again tonight (the caramel sauce) because I am making your pecan pie bars! I did it on the stove this time and and cooked it and cooked it (around 21 minutes). I was scared to cook any longer (swerve is expensive and I did not want to ruin it) but it never did get to the golden color of yours in the pictures. The pecan pie bars are cooling right now. I am excited to try. I live in East TN. I wonder if we have different altitude issues than where you live? Would that make a difference in cooking times? I’m new to baking & eating low carb. I don’t think the altitude would be a problem. Did you use coconut sugar or molasses? That would give you the colour you want. Well, one other thought. I bought swerve powdered instead of granular. Maybe that was it. I used coconut sugar instead of Molassas. When I made the bars I didn’t have vegetable glycerin so I used sf syrup. They came out more like cookie bar than what yours looked like. They tasted really good though and I guess that’s what matters. Thanks! Yes, taste wins in the end! I don’t think the powdered swerve would keep it from getting golden and caramelized but I could be wrong. Well I have kept at it (making the caramel sauce). What I found today was that the granular Swerve DOES make a difference. I used the granular and it cooked right up just like you said! I thought I would let you know just in case anyone else has that same problem( not browning up). 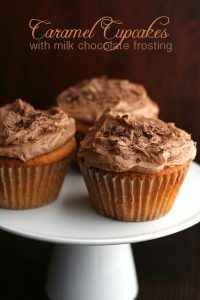 I am making your salted caramel brownie cupcakes & toffee recipes. Thanks for taking all the hard work out for the rest of us by coming up with these delicious ideas. That is VERY good information! Thank you for keeping at it. Okay! Finally made this, AND, OMGEE! Best sauce ever! One million times over. My dad who is visiting from home, Hawaii, is a lover of the other white crack. That being sugar. Well, gave him some Breyers Low Carb ice cream (hey it fills the void) drenched with sauce. He had two bowls and didn’t even now it was refined sugar free. This is a man who was born with a sugarcane stick in his mouth. I’m now needing to make another batch. First batch will be gone in 2.5 seconds. This is the next best thing to sliced bread. I’m on my second batch of this caramel crack in two days. This will be the death of me. I love you. Marry me? Oh dang, I went stalker creepy again 😉 I just made this and oh em gee. Yum. Love. My type 1 daughter and type 2 friends and family are going to have a very Merry Christmas, indeed. Made this today with xylitol and coconut sugar since it was all I had in the cupboard and it turned out good. Tastes just like the caramel on caramel corn. Not sure if that’s how it’s supposed to taste, but it’s still good so that’s all that matters. Yeah, it gets VERY hot! My kitchen smells divine as I just finished with your FABULOUS recipe for CARAMEL SAUCE. Carolyn- my hat off to you ! I did however burn my tongue- really stupid of me ! It is sooo hot and stays hot for quite a while. Never ever add the water to the just completed boil as I did. I lost 1/4 of the perfect concoction as it bubbled all over my stove. Lesson learned*always follow directions to the letter! HI!!! I’m making the magic cookie bars and just finished my first ever batch of this caramel sauce. (which WILL NOT be my last!) I was so stinkin surprised! The first words out of my mouth when I tasted a bit – “Daggone. That’s good stuff.” I laughed at myself for being so surprised. 😉 Thank you for sharing your creativity in these delicious recipes! FYI to all- I made this with half Swerve and half Splenda and it came out wonderfully. (I used the 2 tbs of coconut palm sugar). I made the recipe once before with all Swerve and I don’t like the cooling effect. Also Swerve is too darn expensive. Yes, I know Splenda is artificial. At this point in my eating adventures, that doesn’t really bother me. This batch is delish, the color is fantastic, the consistency is perfect! Hi! This looks delicious and I would love to use it to make the pecan pie. I am slowly building my low carb baking pantry and I don’t have xanthan gum, but I do have guar gum. Since it is such a small amount, do you know/think guar gum would work as a substitute in this recipe? Thank you so much for working on these recipes, they are very inspiring! Really good one! Wondering if a dairy-free version using canned coconut milk would work? A few readers said that they had good luck with that. Have made plenty of your recipes and a die hard fan: always frustrated that we don’t get Swerve in the UK (or I could buy 485g for £61! on Amazon). We have a stevia/eritherol sweetener called Truvia. Do you think this makes a good sub? Where can I find the composition of Swerve to try and compare? Is it pure erythritol? What is the consistency like? Truvia is quite grainy, like white sugar. Truvia is an okay substitute but it doesn’t come in powdered form, as confectioner’s Swerve does. You will get better results if you attempt to powder the Truvia yourself in a coffee grinder or some such thing. How much is serving in teaspoons? 1 tablespoon equals 3 teaspoons. So 6 teaspoons. Felt like I should add…it makes for a good substitute for honey in salad dressing recipes…had some in the fridge and tried it out on a whim in an apple cider vinaigrette…worked really well. I bow to you O Goddess of low carb caramel sauce! My low carb life is so much sweeter since I found your site. Incidentally, I used 6 Tbs erythritol a dropper full of stevia & 1Tbs coconut sugar, 1/2Tbs blackstrap molasses. Came out perfectly! No, splenda will not caramelize like erythritol. Actually, for the record, I DID make this yesterday with Splenda and Coconut Sugar, at the measurements listed, and it turned out great! OH….MY…GAWD!!! This caramel sauce is freakin AMAZING! it tastes just like a liquefied wearther’s caramel candy. I’m in love 🙂 I used organic stevia, and molasses. Thank yooouuuu!!!! Thank you for this awesome recipe. I’ve been looking for a way to use up coconut sugar, since I’m low carb now and generally can’t use it in recipes. Incredibly delicious! It is very hard to find a sugarfree caramel sauce. Tried the coconut sugar for the first time – what else do you use it in? Great on brownie waffles recipe! Thanks!! I love it over ice cream, that’s my favourite. Thank you so so much for creating this!!! I love good, grainy caramel and now I can make it in no time! Just a tip for those who do not want to use molasses or coconut sugar: add some stevia liquid to balance out the Swerve/erythritol coolness and add a teaspoon of maple extract to help make up for the flavor missing from the lack of molasses. It does come out off white colored but after you taste how amazing it is, you’re not going to care. I made a double batch and have to stop myself from sneaking spoonfuls when I’m near the fridge. Hey Angelina, even without the coconut sugar and molasses, was it okay? Did you refrigerate it? Does reheating it make it not grainy again? I’ve never used erythritol before and I was thinking of using Xylitol instead, but the side effects and the calories make me not want to use it. I wanna make this, but don’t wanna use the coconut sugar because it’s very expensive. Yup, I refrigerated it and just heated it up on the stove top or microwave when I wanted to use it. So yummy….. Yes, it tasted great without the molasses or coconut sugar…I think the maple extract helped a lot in substituting. I’ve tried out almost all fake sugars and found that a combo of erythritol and pure liquid stevia works the best (the stevia balances out the cool after taste you typically find with erythritol) as far as taste, avoiding stomach upset and preventing raised blood sugar. I LOVE to bake so always keep granular erythritol (brand doesn’t matter), pure liquid stevia (from Trader Joes) and powdered Swerve on stock. I was wondering if you could substitute monk fruit for the stevia and sugar alcohols? I can’t consume any of those. I’m allergic to stevia (it’s a ragweed) and have terrible GI problems with sugar alcohols. Any ideas? No, there’s simply no way. Monkfruit will not caramelize. Sorry! This is delicious!! just as it is!!! I am wondering how I can use it?? Just dipped it on an Atkins bar and I am soon happy to have a treat!! Thanks for a simple recipe… !! Hi, thank you so much for this site and this wonderful recipe. Found it when I was looking for your Pecan pie recipe. What could you use in place of xanham gum? Chia, Flax, Arrowroot powder, Tapioca? Thank you. None of the above, I’m afraid. Xanthan inhibits recrystallization, which is why I used it. You can skip it, but do expect your caramel sauce to be more gritty and hard when it cools. I this stuff. I have made it several times. I use salted butter and leave the salt out. It’s perfect! Wow! I just finally made this. I can’t get swerve, and I only had a little bit of erythritol, so I went half erythritol and half measurable Splenda. Also, I didn’t really have enough molasses and was all out of blackstrap. But even so, it tastes amazing and so far no crystallizing. I mixed some with lightly toasted pecan pieces and put it on top of a pumpkin cheesecake. Later I’ll add the whipped cream on top. This is for my husband’s birthday cake and I’m pretty excited. Why did I wait so long to make this? Glad it worked so well! So, would this work to make flan. I would usually melt sugar to make the caramel sauce, but I know sweeteners do not melt like sugar does. I want to make salted caramel pot de creme, but not sure if this would work. Yes, this would probably work with flan. I’m having a high insulin issue, and the thought of not having pecan pie this Turkey Day was making me very sad, so thank you! Yes people have had success with coconut milk in this recipe. Hey guys! Do you know if using coconut milk makes it have that coconut taste? Evn a little? I’m scared of that coconut taste infiltrating the caramel! Think cashew milk would work?? I think coconut milk would have a bit of coconut flavour. I am doubtful that cashew milk is thick enough to produce a proper caramel sauce but you could certainly try! Thank you for this recipe! I don’t have swerve so I used 4 tablespoons of trim healthy mama sweet blend and a half tablespoon of molasses. The first time I made it, I used a whole tablespoon of molasses and it was too strong for me so I used half. It’s delicious! I am using it to top my turtles cheesecake! Which taste better the coconut sugar or the molasess? I prefer the coconut sugar. Used this recipes to make a saled caramel apple sauce for my grain free gingerbread pancakes. Satisfying without being obnoxiously sweet! Blackstrap molasses added a depth of flavor that I really loved. *On a side note; I find it offensive that an earlier reader demanded the creator of the recipe modify it to satisfy the reader’s opinions. If you won’t like how a recipe is written, make your own modifications! Simple as that! Hmmm, I don’t even remember that comment. But thanks! Can I use arrowroot rather then zanthum gum? I’ve used it in other recipes but not desserts. Not sure. Part of the reason for xanthan gum is that it inhibits recrystallization. Not sure that arrowroot would do that. Hi Carolyn 🙂 The caramel sauce came out perfect. Thank you for the recipe! I am also diabetic, and I think the Swerve is spiking my blood sugar. I know xylitol does for sure. I guess I get no break. But I’m sure if I tried this with plain old sugar, the spike would be worse. I’m afraid to try it. Anyway, I am going to try like maybe just one tablespoon. If I can’t handle it, I guess I should add insulin along with my Metformin, cause life’s just too short to live without caramel sauce! That’s unfortunate. I have no spike whatsoever from Swerve. Have you tested that out with just Swerve? It could be something else…like the coconut sugar. This recipe saved my caramel sauce! I was trying a recipe and their recipe was not working so I added some ingredients and instructions from yours and voila perfection! Thank you! Just to let others know – tried a double batch with 1 box (1C) Trader Joe’s Stabilized Whipping Cream, split the Coconut Sugar and Molasses (half of what is called for each) used 1/2C erythritol and 1tsp stevia glycerite – came out AMAZING! Tastes like the caramel on Chicago’s Garrets Caramel Corn – YUM! The only issue I had was blending the Xanthum Gum – got kind of clumpy. But after cooling down in fridge and upon reheating and stirring vigorously – it all came together beautifully! Great Job, Carolyn! it says “Bring to a boil and cook 3 to 5 minutes (be careful not to burn it).” How do we know when it has cooked enough? With sugar, you can drop a bit into cold water to check for the stage it is at. Is there any way to judge when this is done? What will happen if it is under-cooked? I just tried – and ruined- a batch because it burned. . . it never stuck to the pan and the color didn’t seem to change as it cooked, then suddenly turned black with no intermediate stages! It should absolutely have intermediate stages of going more amber in colour. This is not the same as sugar, and it will smoke some as you boil it. Thanks for sharing! I made this with the molasses and it turned out well. The molasses made it a bit darker than expected (just for others to note) and my daughter thought it gave it a touch of pumpkin spice taste(? ), haha. Will enjoy using this soon! ? Do you prefer swerve in all of your recipes or do you sometimes use other sweeteners? And it’s fairly expensive, do you know where to get if for a reasonable price? Sounds delicious. I sometimes use other sweeteners but this recipe requires Swerve. It’s sometimes on sale, I would keep your eye on it for deals! For dairy free, can I replace butter with coconut oil? I see I can use coconut cream in place of whip cream. I, too, used powdered xylitol with coconut sugar and it turned out AMAZINGLY! Thank you so much for this recipe. This is fabulous, it’s always in my fridge now. Love it in my coffee! I am a convert. Me too! I’ve been a mission to replace my caramel macchiato fix for some time. Sugar syrups, extracts, and oils just weren’t working. So nice to make this and get it right. Which form of swerve do you use here? The granulated or the confectioners? Really lovely recipe! I will make it today. I will be making the caramel with all coconut sugar. For some sad reason swerve gives me painful digestive issues. Hope it turns out. That being said It is doubtful that I will eat so many that the sugars will be harmful. I have been involved with health and healing since 1972 (!) and can happily say that I have never had health problems. In that time there have always been people lecturing on the dangers of any kind of sugars and whatever else they have decided is evil. I feel coconut sugar, maple syrup, and honey in small amounts have enhanced my health and well being. Those who are needing to lecture us all might need to start their own blogs… thanks for all of your real work involving health. If you didn’t mind having some actual sugar in it could you sub out something like rapadura for the coconut sugar? Found it!, Can’t wait to try it, I love, love, love caramel! So excited! I’ve see-sawed back and forth on low carb/keto diets for years. It works great for me, but I typically cave in the latter part of the year with goodies from Halloween through Christmas. Being able to find low carb dessert options like this will make the transition so much easier and not feel quite so sacrificial. I look forward to following your newsletter and helpful posts. Not sure what went wrong with my sauce but it separated from the butter. I used molasses. Should I try heating it up again? I am not at all sure why it separated. It’s never happened to me and I make this often. too much heat might be the culprit…keep it lower if you need too. Also, the xanthan gum should bring it all back together when you whisk it in. I didn’t have xanthan gum so I used guar gum. Should I try cornstarch instead? It looked really great before the second heating. When it said bring to a boil I really did crank the heat to get it to boil stirring constantly but maybe that’s what did it. Could I make this into a caramel candy? How would I get it to that consistency? Sorry, I don’t really have any suggestions. It does harden a bit after cooling but you’ll never really get that chewy caramel consistency without sugar. My sauce separated while cooking. Can anyone tell me what I did wrong? Did you use any ingredient different than the one I had listed? It should come back together when you whisk in the xanthan gum. Made this sauce and it worked perfectly. :). I made it for the low-carb Twix cookies and will now be making it for other recipes (and ice cream) too. YUMMY — thanks again for a wonderful, easy-to-make recipe!! Just made this…it is excellent! Pouring over unsalted mixed nuts and freezing for a treat similar to peanut brittle. Thanks for all your hard work! I had to comment. This recipe rocks! I used full fat coconut milk instead of cream or half and half. I used 4tbsp erythritol and 2tbsp of brown sugar Splenda instead of Swerve. And a word to the wise, don’t use a plastic spoon, it melted in the Carmel, had to throw out that batch. Second batch, wooden spoon, perfection! Made this to go on top of a apple pie bread pudding that I used your apple cider donut recipe and rehydrated dried apples in water with apple cider, swerve, and cinnamon. DIVINE! Seriously, this tastes like the real deal. I added 1tblsp of vegetable glycerin at the end to help with crystallization and I used the liquid from the apples after hydration in place of the water. THANK YOU! Could you use Stevia (granulated) instead of Swerve ? We don’t have Swerve locally. No, stevia does not caramelize. You need some sort of erythritol based sweetener. Not sure how to make it chewy, sadly. But it does firm up in the fridge and then you could roll it into balls and dip in chocolate. That’s a great idea! I could also pour the first half of the fat bomb, let it partially harden, somehow put a dent in the middle and pour some caramel in, let that harden, then put the remainder of the fat bomb on top. I live in China so in the land of dumplings, noodles, and fried rice, living low carb hasn’t been easy. Now it’s apple season and I’ve been resisting the salted caramel I’ve been making for years. I just made your low carb caramel recipe, exactly as you wrote it with coconut sugar. OUTSTANDING. The swerve is undetectable. Thank you for everything you do for your followers! Can I use this caramel sauce to make a caramel candy? Thanks! No, not really. It doesn’t harden and become chewy the way something made with sugar does. if I make syrup with swerve, it crystalizes and becomes rock hard. Do you think using xylitol would work? Maybe combining it with stevia (liquid)? Thank you for all your great recipes!!! Love your recipes! 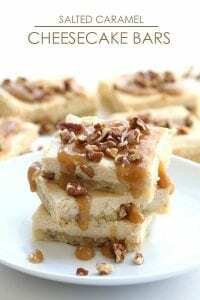 I am wondering if I can use this caramel recipe in place of the caramel recipe in the chocolate pecan pie bars. I just finished making this and it is absolutely amazing. Thank you for developing such a great recipe. Turned out perfect. I’m so excited to try this! And the Twix Cookies! But I don’t have Xanthum Gum. Do you think I could use Glucomannan instead? I know they are often interchangeable. You probably could but I am not sure how much. Hi there! I think this recipe is great, but I am definitely doing something wrong and I’m not sure what it is. 🙁 The first two batches I made burned. I looked through the comments to see if anyone else had similar problems and I saw that for the electric stove I needed to lower the heat. I did that,but the problem is that it continued to burn without ever coming to a boil, despite vigorous stirring. I ended up just pulling it off the stove after about 15 minutes of hot-but not boiling – but still kind of wanting burn cooking and added the cream and the xanthan gum. I ended up putting it in my bullet to blend it because the gum didn’t want to blend completely. What I ended up with was still great – it has a very fluffy texture and it tastes wonderful, but it’s not the same product that we have here lol. Any advice? I use stainless steel cookware – could that be part of the problem? Thanks! It’s not the cookware, I have stainless steel too and have made this recipe plenty of times in it. I am really not sure what’s going on if you have your heat on low. It really shouldn’t be doing that. Is your heat on the lowest setting already? This is fantastic!!!! I want you to know that we truly appreciate your hard work. Some people are just so ungrateful, and rude – if people want a caramel sauce with absolutely zero carbs, they’re better off buying some Torani caramel syrup and put up with all the chemicals and crap in it. 2 tbsp of coconut sugar is not much considering most people won’t be consuming the entire recipe all at once. I am going to try and add some butterscotch extract to this and see what happens. Thank you again!!! Oh yeah, I made this yesterday because I have been missing caramel sauce something fierce. This is absolutely amazing!!! I used a packet of stweetleaf stevia because the other sweeteners cause stomach issues for me. I just poured a little over some homemade whipped cream and it was the best dessert I have had in months. I highly recommend! Thanks so much! Carolyn, Do you think this recipe would work for sugar free caramel chews? I was thinking if they are firm until heated I could cut them into squares and wrap them in wax paper. It’s not exactly chewy but it would be tasty. This is so ridiculously good! I just made a batch to drizzle over your brownie cheesecake, also yummy. 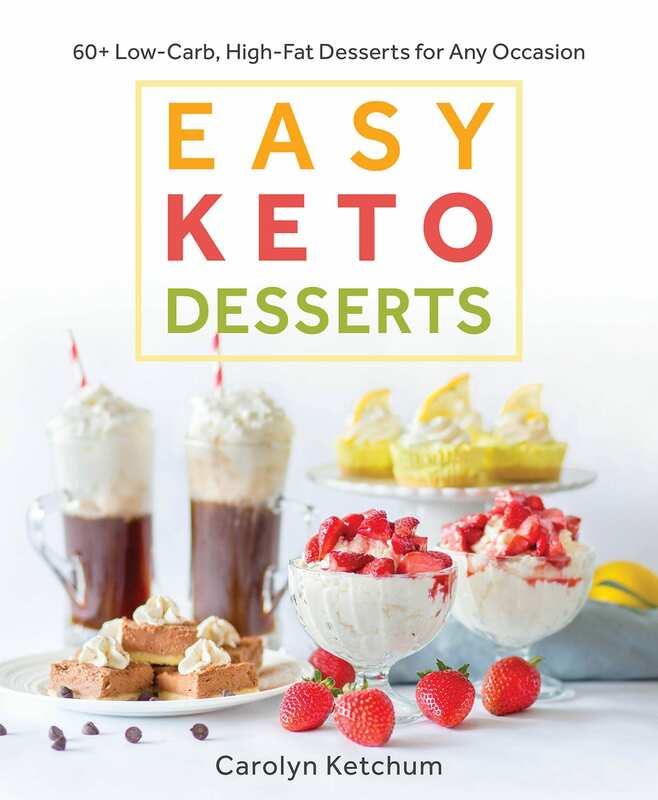 My husband and I both eat keto–I love sweets and baking and your recipes allow me both while still staying on track. Thank you so much! I have two questions about the caramel recipe. First, will it work with powdered Swerve? I need to make a second batch to make one of your cookie recipes for book club and only have powdered. Second, if I swirl it into ice cream, will it harden too much? I think it will work with powdered but not sure. 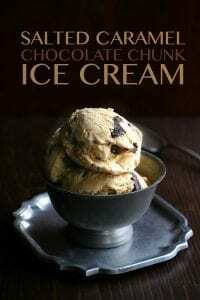 Not sure about the ice cream either but it sure sounds good! You can try the Truvia but honestly it’s much sweeter and I don’t know that it caramelized very well. I’m making a bunch of keto truffles (using Lilys chocolate chips and coconut oil) and thought how decadent would salted caramel truffles be!? Made this recipe using monk fruit/erythritol blend, molasses, and twice the xanthan gum. It’s cooling on the stove now, and HOLY **** this is amazing. I’m an ex-pastry chef and honestly this is as good as regular caramel. Thank you for this amazing blog and so glad to see you still reply to comments. Thank you, I really love hearing that! Also, congrats on the holistic healing course! 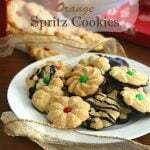 I came across this awesomeness because I found your Carmelita recipe awesomeness!! 🙂 Gonna make those to take to a dog show tomorrow. But quick question, I don’t have xantham gum?? Never used it? Not even sure where to buy? Can I omit/substitute? Thank you, I am so eager to try the Carmelitas!! 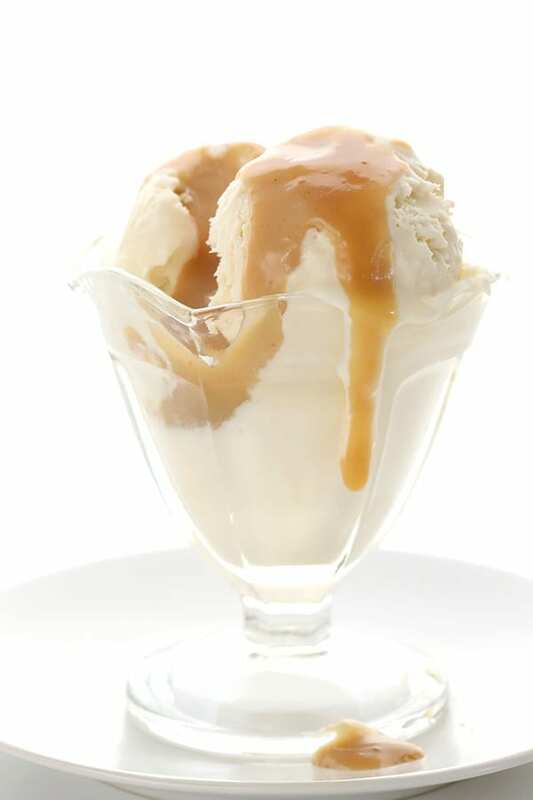 In this recipe, it helps to keep the caramel sauce from re-crystallizing. You can skip it but your sauce will get grainy. You can actually find it pretty easily in the gluten-free aisle of many grocery stores. What about chia or flax? that would not work here. Xanthan has properties that inhibit recrystallization. Chia and flax do not. And you’d end up with chunks of chia and flax in your caramel. O.M.G!!!!! 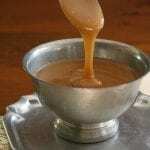 Just made this caramel sauce for your carmelita recipe. It’s a miracle I am not now making just plain ‘Litas’ as I wanted to eat all of it!! And I don’t even like caramel that much. It is BEEEYOUTIFUL!!!! I did sub for the xantham gum, used flax. And used 5tbsp baking stevia (what I had) + 2 tbsp coconut sugar. It is superb. Reading notes, I opted to stir mine the whole entire time, start to finish. Perfect. THANK YOU!!! Hi Carolyn, thanks for such a delicious tasting caramel recipe. I read in the description that it is supposed to be “ooey” and “gooey”, but the texture on mine came out more like a soft pudding. The taste is absolutely delicious, but I’m not sure the texture like yours. The texture of yours looks like a liquid carmely, gooey texture. But mine is not like that. Like I said, it’s like pudding. I didn’t substitute anything. As I was cooking the butter and sugars, swerve, I was really excited because it looked and tasted like caramel, but then when I added the cream, it became soupy like milk, then added the xanthan gum and cooked for another minute or so and it thickened up a bit, but didn’t have that carmely texture. It started to be more like pudding or gravy. What did I do wrong? It’s still delicious, but I miss the carmely texture. It sounds as if you didn’t cook it long enough, although I can’t say for sure. When you add the cream, it should boil and bubble like crazy, not become soupy. I did notice that the cream didn’t boil up when I added it. I boiled the sugars for 5 minutes. I didn’t want to burn it. Is there a test or a way to tell if the mixture has been cooked enough before adding the cream? Again, thanks so much for sharing this wonderful recipe and taking time to answer questions. It’s really appreciated. There’s no real test but if the mixture is ready, it kind of boils thickly, if you know what I mean…like the bubbles come to the surface more slowly and lazily. Is there a way to keep the Swerve from re-crystallizing after it cools so that the texture isn’t gritty? How about replacing it (or the coconut sugar) with xylitol? Also, you can buy molasses extract on Amazon if you really don’t want the carbs from it. It tastes the same, but be aware that it’s extremely expensive. I was skeptical, oh so skeptical, but oh my goodness this caramel sauce is so delicious! I am insulin resistant and eat a low to moderated carb diet. I have to be very careful of my sugar intake and am about to enter into the world of sugar free ice cream. This sauce is delicate in flavor and truly does taste like the “caramel” of a buttery “caramel corn”. I made this and your hot fudge sauce and both are just divine! I am usually pretty sensitive to the “cooling sensation” of Swerve but in these recipes I don’t really detect it. I followed the recipes to the letter with the ingredients provided, no substitutions. For the caramel sauce I used the coconut sugar as it was the easiest to find at my local Walmart. Thank you for working so hard on recipes and maintaining your site. I think you are the most comprehensive out there and so far that I have found, the most delicious! Next I will be trying out your ice creams to go with these delicious sauces! Thank you! Hi, do you know if THM gentle sweet will work in place of the Swerve? Also, can xantham gum be replaced with glucomannan in this recipe? I made your Kentucky Butter Cake a few weeks ago and it was delicious. This time, I want to make this caramel sauce to go with it but wondered about making those substitutions. Thank you! Since THM sweeteners are much sweeter than Swerve, they don’t caramelize as well and you don’t have as much volume. So you can try but I can’t guarantee the results. O.M.G. Best caramel sauce ever. The coconut sugar really adds to the smell of caramel. Because of this recipe, my teens, who were getting a little keto-bored, now think I’m magical. That is all. Yay! We like keto magic. I love this! Is there a way to make this a recipe that can be hardened and cut into small candies? No, it doesn’t harden like that. Sorry. Is there a replacement for the gum? Can I just omit it? You can omit but your caramel will likely harden and crystallize more upon cooling. I made this for Thanksgiving Dinner (the first low-carb or keto dinner since becoming LCHF). It was a super hit! I didn’t have coconut sugar, so I used Truvia (plus, only two of the four at dinner are LCHF, maybe we’re making converts? )… I realize that changes the sugar content, next time I’ll use the right stuff. 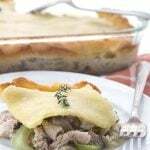 Thank you for this recipe, my dear husband has already requested it as a repeat for Christmas Dinner! 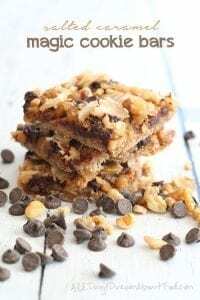 I made this for the Magic Cookie Bars, and made a double batch while I was at it, to put over ice cream. Yum! I had a thought, though, when I was just cooking the butter and sweetener, before I added anything else. When I set the spoon I was stirring it with down and the bits of mixture cooled, it seemed almost like penuche. I love penuche! I may try making a small batch and see how it turns out. It reminded me of when my mother-in-law used to make homemade caramels at Christmas and sometimes she cooked the mixture either too much or not enough (I’m thinking not enough now) and I liked it better than the caramels. Anyway, the sauce is amazing, whether on the magic cookie bars, on ice cream, or straight from a spoon 🙂 Thank you so much, Carolyn, for your recipes. My body is so much happier without all that sugar. OH MY GOSH!!! ABSOLUTELY DELICIOUS AND ONE WOULD NEVER, EVER KNOW THAT THIS IS LOW CARB! YOU ARE AMAZING AND THANK YOU! THANK YOU!!!! It was shy of a cup so I just used the whole amount for the Pecan Pie. SO eager for this pie tonight! It’s in the oven now. Cauliflower Crust pizza for dinner and pie for later…I’m in heaven! This is a winner-so good drizzled with lc caramel sauce (your recipe too). 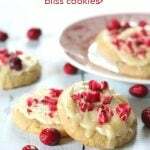 The only substitution I made is Bob’s Red Mill Fine Macaroon Coconut for the coconut flour-I don’t like the taste or texture of coconut flour but do like other forms of coconut. Yes – I want to put this on everything! I can’t wait to put this on everything! Perfect sauce for so many applications from cookies to ice cream to anything your heart can imagine! Sorry if this question has already been asked, but there are so many comments it’s hard to read through them all. Do you use granulated Swerve or confectioners? I find a lot of recipes don’t specify but one usually works much better than the other. Thanks!!! I just finished making this! It’s delish!! I didn’t have Swerve, however the Pyure seemed to incorporate just fine. Everything melted well together, and it doesn’t even seem like it will crystallize at all. I’m making your caramel cupcakes in the morning. So excited to see how they turn out! Thanks for taking the time to perfect this caramel sauce! Can you tell me, I think I missed it, the best way to store this? I love caramel lattes with almond milk and am so thankful I found this recipe. I will be taking this to work with me as I’ll be making my lattes and not buying them anymore. I thought I would have to give them up completely. I put the caramel sauce into a Ball jar – is it ok to leave on the shelf or best in the fridge. Lucia again – disregard my previous comment/question! I reread the recipe and found my answer. Thank you! Carolyn, can this be used to make caramel popcorn? I don’t eat popcorn but I can’t see why not. Hi….this had me drooling. Looks yum…but before I can try it I need a clarification. I can’t get xantham gum here..can I use arrowroot powder instead? If yes, how much would you recommend? Thanks for all the effort you put in on our behalf. Arrowroot would not be a good substitute in this case. You can skip the xanthan if you need to but it may not have a “syrup-y” consistency. Hi…new as I am to Low carb diet I needed a small clarification. In my efforts to locate a seller for coconut sugar I did some research on this product. According to the info I gathered coconut sugar as exactly the same as regular white sugar apart from the hint of caramel flavour and it’s effects on the body are similar to regular sugar. Which brings me to the question would regular dark brown sugar do in the absence of coconut sugar for making this caramel sauce? Also may I know your reason for choosing coconut sugar over brown sugar?Thanks. I made this caramel for my Keto salted caramel cheesecake! it was amazing. SO TASTY! And easy! I used coconut sugar but have ordered some black strap molasses for my next batch to see if it makes a difference. I did notice it became a little grainy after refrigerating so I put it in a pan and heated it gently and they all went away and I was able to put it in a squeeze bottle to drizzle on the cheesecake. I am so bad at recipes based on boiling on the stove, and as usual my “caramel” came out runny. Very tasty though, so I plan on making a modified white russian, having just finished filtering another batch of your “Kahlua.” I think this runny caramel will be perfect in a white russian, though I guess I’ll have to call it something else. Next time I will boil it more aggressively. Never mastered this type of sweet even with sugar. Did the recipe change? I’ve made it in the past and used coconut sugar and now I don’t see it in the recipe. It was so good the way it was before! If you took it out, could you please let me know how much coconut sugar was in the previous recipe? Thanks! I just wanted to say that instead of the yacon or molasses, I added Lorann Oils Cream Caramel Naturals and it was amazing! Kept carbs a bit lower and it tasted just like caramel sauce 🙂 I actually made it this way by mistake because I started baking the crust for magic cookies and then realized you had yacon/molasses for the sauce, which I didn’t have. But still turned out great! When you list butter in your recipes are we to use salted or unsalted? Thanks. For this recipe, that is up to you. I use salted. You’re putting a bit of salt in it anyway. Just, Wow! I can’t wait to try this. I haven’t seen Brown Swerve in the stores yet. Is it widely distributed? Hi Carolyn, if it’s not too inconvenient for you, could I have the old caramel sauce recipe, please? I’m sure this new recipe is excellent, and it’s fun to see you modify and update older recipes as you continue to innovate. My family really enjoyed the older version made with a touch of molasses, and I don’t plan to buy Swerve Brown or (the rather expensive) BochaSweet right now. Thanks for your time! I don’t see my previous comment, but just wanted to apologize for not reading the recipe notes to find the original Swerve and molasses amounts, for which I had asked. Thank you for posting those, Carolyn, and I’m sorry for not making better use of my eyes! Amazing that you pulled this off. I’ve never had bocha sugar but I’m definitely interested in trying it out. Who knew sugar free could be so good! This Caramel Sauce is amazing! I’m going to put it on all my desserts! This is SO GOOD, omg! I couldn’t stop eating it, right out of the jar! Even my husband kept dipping into it, and he’s not a big fan of low-carb sweets usually! I didn’t have the Swerve Brown so I used Sukrin Gold, and the color came out a little pale, but that didn’t stop us! Still, I may add a hint of molasses to get that proper caramel color next time. I predict this sauce will become a fixture in our house. Hi I’m new to Keto and Low Carb but found All Day I Dream About Food and can not believe the great tasting recipes you make, Thank You Carolyn! The reason I’m replying to your post Melinda is that I was just going to ask the question on using Sukrin products and you answered it. I will try to get Swerve Brown but I live in Canada and its expensive to order from Amazon but so worth it, just wish I could find it here. Swerve is available in a lot of places in Canada, including regular grocery stores. So Swerve Brown should be on its way soon! Any idea if using monk fruit in the raw as a substitute? No, I am sorry. Monk fruit will not caramelize like erythritol or Bocha Sweet and the “In the Raw” brand is bulked with maltodextrin. It’s not a great choice for this recipe. I have already have Yacon syrup and Lakanto Gold (monk fruit “brown” sugar with erythritol), plus both Swerve powdered and granular. Have you ever used monk fruit with eriroy? Wondering if that will work in place of brown Swerve? How do I replace the Boca Sweet with Swerve, what ratio, or would it be same amounts? Thanks! LOVE all your recipes!! Okay so if you use Lakanto and Swerve or all of one of them, they are both erythritol based, which means your caramel won’t stay soft. It will still be good, it will just re-crystallize a bit. But you can do something like this: Half Lakanto, half Swerve granular, plus 1 to 2 tsp Yacon… the flavor will be spot on. Usually, I use Swerve or Swerve + Truvia for Carolyn’s caramel sauce, but I just started using Lakanto so thought I’d try it in lieu of Swerve. Made with granulated Lakanto, the sauce re-crystallized terribly. It was actually pretty amazing. It began to recrystalize as soon as it began to cool slightly, and was mostly solid after sitting on the stove for half an hour. Tasted good, but had a texture like fine wet sand. I like Lakanto, but I think Swerve is the better choice here. The oligosaccharides in it must help impede recrystalizing. I do want to try the new recipe eventually; I’m sure it’s fantastic. Guuuuuurrrrl!!!! I don’t even know what to say! You are unbelievable!! I just made this and it is AMAZING!! I have missed caramel so much! And now I don’t have to anymore! THANK YOU!!! Hooray, glad you liked it! forgot to tell you….I make your vanilla bean semifreddo from your desserts cookbook and put it in my popsicle molds to make ice cream bars. I will now be making this and swirling it into the bars before I freeze them, then covering them in the sugar free chocolate you have listed for your peanut butter popsicles! I can’t wait to try this. I love them without the caramel, so I know I’m going to love them even more with it!! Hi Carolyn!! I made this for the first time this weekend and wanted to give you some feedback regarding high altitude. I kept waiting for my caramel to boil to start counting down the minutes to cook it. I just kept cooking and stirring. It never did boil, it just burned. Threw away that batch and did another and just cooked it for three minutes after it got hot. That came out great. 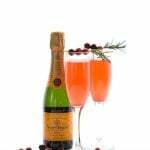 This recipe is amazing, but takes some adjustment with altitude! This mixture will not boil in high altitudes. 🙂 We are at about 4500 ft.
Hey Sharon that is fascinating. Thank you! Hi Carolyn, I’m ready to make this delicious sounding recipe and have read through pages of comments. I think this recipe has generated more than any recipe I have seen of yours! Ok, I do not see in the recipe where it called for coconut sugar or molasses. Has it been changed? Also, Amazon is out of Bocha…..what is a good sub for that (not sure I know what it even is). I do have Sukrin Gold and usually use Tagatose as a sweetener which browns nicely. 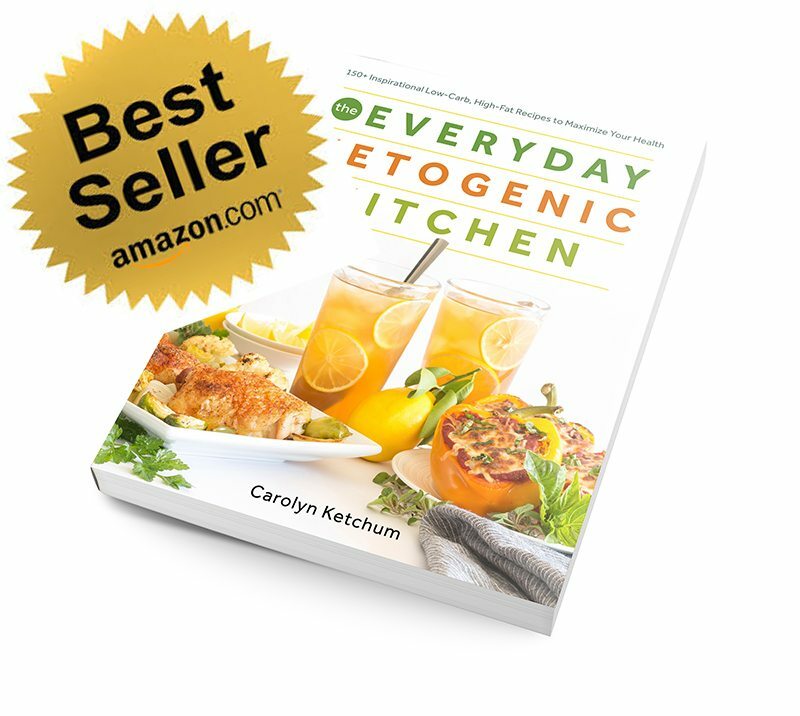 Thanks for ALL your hard work developing and perfecting your recipes! Ihave not been able to find the Bocha sweet either. I even went to the Bocha website. Is this common? They have run out…apparently I sent a lot of traffic their way and they had low stock. It will be back soon but you can also try using xylitol. Two quick questions. Have you tried this with allulose, by any chance? Since the bocha is still sold out, I’d like to give this a try with allulose + swerve brown – yacon. Also, have you tested your blood when using bocha (or allulose, for that matter) and if so, do you see a spike? Hi Linda…. Yes, I think allulose would have the same properties, from what I’ve read. I have some but haven’t yet used it. And thus far, with Bocha Sweet, I see no spikes. I always use it half and half, though – half Swerve, half Bocha because on its own, it’s has made things overly soft at times. Also, it can be a bit hard on some people’s tummies, according to the Amazon reviews. I haven’t yet experienced that. But I really think that combining it here with Swerve is the best way to go. They seem to work very well in concert. Thank you, Carolyn! 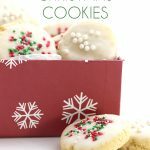 I love, love, love your site and recipes! 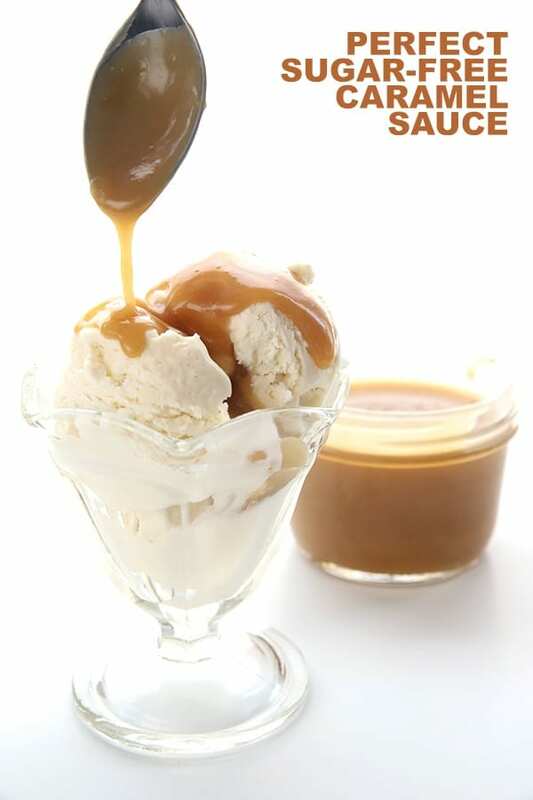 I just love the old recipe caramel sauce so I can’t wait to try this one too. It really is the best caramel sauce ever. I was wondering on the above, if I can’t get the Bocha Sweet you suggest using 6 tbsp swerve and yacon. Do you still include the swerve brown then in addition to the 6 tbsp of swerve granular or is this in lieu of of both the bocha and the swerve brown. Thank you again for a wonderful recipe. Can’t imagine it being much better than the previous. Just LOVE LOVE LOVE it. If you can’t get Bocha Sweet, you could try xylitol in its place (be careful if you have dogs!). But if not, then do the 6 tbsp regular swerve (not brown) and the Yacon. So glad it’s so adaptable! What is the difference between the two sugars in the recipe? Can I only use swerve brown?? You can, but as I explain in the post, it will recrystallize and won’t have a great consistency as it cools. I love your caramel sauce – the only one I use. (actually love all your dessert recipes that I have tried). 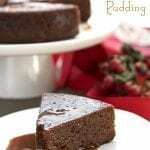 With this awesome sauce, have you ever tried to Keto-fy “Sticky Date Pudding”. 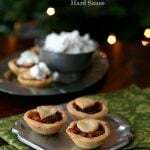 Would love to make it as it is one of my husband’s favourite and I keep trying to keep him off sugar but not sure what I would use to replace the dates. Do you meant something like the British Sticky Toffee Pudding? I am actually planning a version for the holidays. I may use a tiny bit of dates for authenticity but they would be very little. Amazon is out of the Bocha- is there THM substitute that you have found suitable? I list substitutes in the recipe notes. That should help! You can order on the Bocha Sweet website….same price when you include their shipping and they said it gets there in 3-4 days. Has anyone tried stevia instead of bocha sweet. im from panama (a very small country) and i cant get bocha sweet, the syrup neither blackstrap molasses. Please help ! i need to try this. Stevia won’t caramelize, I am afraid. Can you get xylitol? Oh. My. Goodness. Finally got my BochaSweet and the first thing I did is to come right here, to this recipe. And it’s all that everyone said it is, and more. Best sugar free thing that I’ve tasted in two years. I now have a major problem because I will want to mix Bocha and Swerve for all of the things! Carolyn, the next thing we need is a new hot fudge sauce. Please say you’re up to the challenge! Replace the Bocha Sweet with xylitol. Use Swerve brown or regular swerve plus 2 teaspoons of Yacon or molasses. I was about to ask a similar question. I have golden monkfruit, granulated and powdered Swerve and Xylosweet. Would any combo of these give results close to yours? The “golden monk fruit”…is it Lankanto? In which case, that would be your brown sugar sub. Xylosweet would be the best to replace the Bocha Sweet. I finally got some BochaSweet! I have Sukrin Gold instead off the Swerve Brown so can that be an equal substitute? Yes, it should be fine. It’s a little lighter than swerve brown but it should work. wishing you and yours an amazing holiday filled with Love! You too! Thanks so much! Oh man this is the best!!! My daughter requested Salted Caramel Cheesecake with cookie dough for a Thanksgiving dessert. Searched but only came up with the salted caramel cheesecake and found this topping, so many great reviews so I went out on a limb and bought both Swerve brown and Bocha Sweet, this could not be better!!!!! Thank you!! Thank you sooooo much! I only had swerve and surkin brown sugar substitute. I used 4 T surkin, 2 T swerve and it’s heaven! 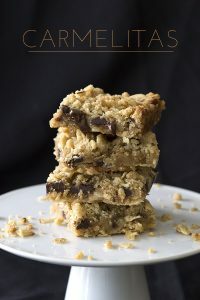 One of my fav things in life is See’s Candies Butterscotch squares and if i was any good in the kitchen this is the recipe I’d use to try to recreate them. Wow. Wow. Beautiful recipe for this Carmel lovers dream!! Hi, I live in the UK and the ingredients are soo expensive to get on amazon uk. I don’t have swerve brown, but have some unused Sukrin gold. Would this work? I know it isn’t as good as swerve because I have the other swerve sweeteners. Also in the caramel cake it states whey protein powder, again very expensive. I have some collagen powder, could I use that. The sukrin gold is fine but the collagen powder is not. It will make it very gummy. You can skip it altogether but the cake won’t rise quite as well. Wow a keeper for sure! I’m keto and this caramel sauce is now a staple in the refrigerator along with chocolate drizzle. I used allulose and it works the best. Swerve went grainy. Love this recipe! Just a little confused about the molasses and Swerve granular substitute. If I can’t find Bocha Sweet, am I supposed to sub the 6 tbsp of Swerve Granular and 2 tsp molasses for BOTH the Swerve Brown and Bocha Sweet, or just in place of the Bocha Sweet alone? If you can’t find Bocha Sweet or xylitol or allulose (all of them work), then yes, use the Swerve Granular and 2 tsp molasses and it will still be great, although more likely to recrystallize. The molasses does help inhibit that a bit. Hi! I am so excited I found this recipe! I dont have BochaSweet or Xylitol. But, I do have powdered Monk Fruit/Erythtritol blend, granular Mok Fruit Blend and Lakanto golden… how would those work? No, sadly, they won’t because they are all erythritol based. I mean… they WILL work but your caramel sauce will re-crystallize in the end. I just made a caramel macchiato with this delightful stuff! Two of my favorite things, coffee and caramel. I never thought I would be able to make a sf- low carb version of a macchiato but this was perfect for it. Thanks for this amazing recipe.